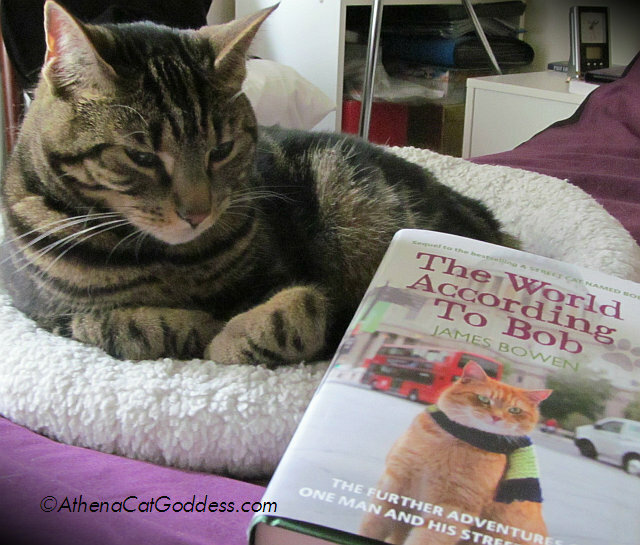 I love Streetcat Bob and so does my mum (as well as so many people all over the world) so here I am posing with his latest book The World According To Bob. Isn't he just so handsome? Mum read this book, and just like with the first, A Streetcat Named Bob, she had tears in her eyes. I hope she wasn't too sad, because she told me there were some fun stories in this book and not just sad ones. I suppose she cried because she was thinking about our love for one another. We do have a very strong bond, as you can probably tell. Anyway, Mum has published a review of the book on her blog so go and read it if you're interested.